The power cat can also be a real passage-making boat! As power catamarans seem to be making a comeback, shaking up the design teams, we talk to a former sailing champion and well-respected authority on the matter about his experiences. Back in 2008 we had spent a couple of days with Laurent Bourgnon and his family at Port Camargue, France, during the preparation of the Sunreef 70, “Jambo”. The future expedition catamaran had just been on display at Cannes after arriving there from its shakedown delivery from the shipyard at Gdansk in the Baltic. Six years have since passed and we made the most of Laurent being at the last Cannes Boat Show to catch up, and have a look with hindsight at how he had got on, and if he had any ideas which could be incorporated into future models in the series. The first mate’s opinions have not been left out either! The test of the most recent Moorings 514PC amply demonstrates the development of the Power Cat as part of the charter fleet. In an exclusive interview, Lex Raas (former CEO of Moorings and developer of Aquila Catamarans) also offers his view of the market. The fairly specific area of power trimarans is not dealt with here, but will be discussed in a forthcoming article. It’s in his blood! The twice-winner of the Route du Rhum and holder for 10 years of every category of single-handed 24 hour speed records is fanatical about helming, but also putting extreme vessels into action. After going over to the dark side of family motor-cruising, his passion for the challenge remains the same. Half a circumnavigation later (via the Patagonian channels), “Jambo” is now being used professionally as a diving expedition vessel based out of Tahiti and operating in Polynesia’s Leeward Islands (Raiatea and Maupiti) and the Windward Islands (the Tuamotus, Australs and Marquesas), before continuing on westwards. 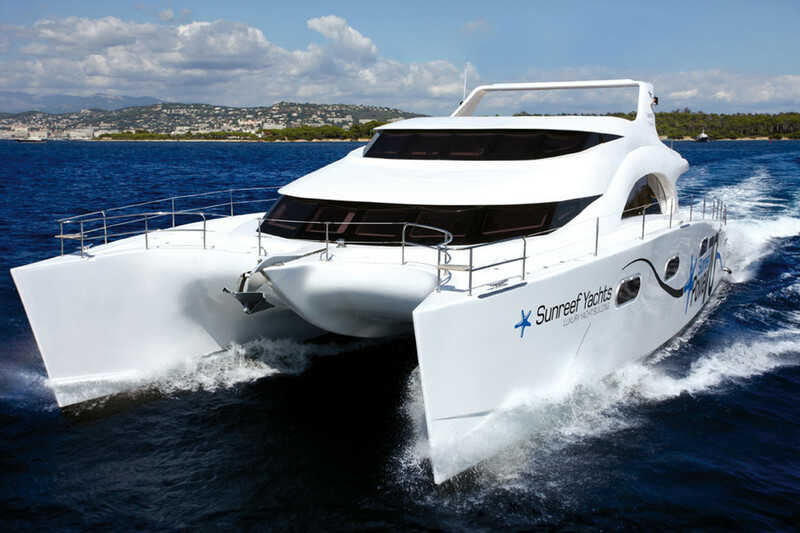 Already well set-up from the start (see Multihulls World No.104 March 2009 edition), the prototype Sunreef 70 has undergone two further evolutionary stages, the latter requiring six months work in New Zealand. This latest phase, described by Laurent as being economically difficult to justify were it not for its specific use also bears witness to his taste for technical challenges. This little “wandering dive school” provides excellent accommodation and top of the range equipment, and its reputation extends beyond Polynesia’s boundaries (the reconnaissance for James Cameron’s future sub-marine work was done on board!). What’s more, she is championing levels of economy (for a 60 ton vessel), and is gaining respect in all her areas of development. As we reported in our test in 2009, this was conceived as an experimental vessel , designed to serve as both a family cruising project, and also as a prototype for a future production model! Built in epoxy, and having exceptional self-sufficiency (20 tonnes of fuel) and significantly lengthened sugar-scoops, this special Sunreef 70 completed an inaugural tour of Europe at cruising speed (10 knots) and successfully handled its first severe weather in the Mediterranean. At this speed, fuel consumption worked out at 26.5 liters/hour with both motors at 2,500 rpm.